With the historic use of toxic mercury amalgam fillings, excessive courses of antibiotics, damaging childhood vaccines, and the many industrial pollutants and chemicals that have been spread into our air, water, and food over the past century, general holistic health guidelines are simply no longer adequate for most people. Only through radical measures--that is, getting to the true root or underlying cause of disease--can effective healing occur. In Radical Medicine, naturopathic physician Louisa Williams describes how to treat these and other modern-day “obstacles to cure,” in order to ensure against future degenerative disease and achieve the optimal health that is our birthright. Examining the many health problems triggered by dental amalgams and poor dentistry, Dr. Williams explains that our teeth are focal points for health issues that arise elsewhere in the body. She explores the impact of vaccinations, the excessive use of antibiotics, and the chemical-laden products used as health and beauty aids--which are linked to Alzheimer’s disease, heart attacks, and breast and other cancers--and provides information on cutting-edge detoxification treatments as well as drainage and nutritional therapies. 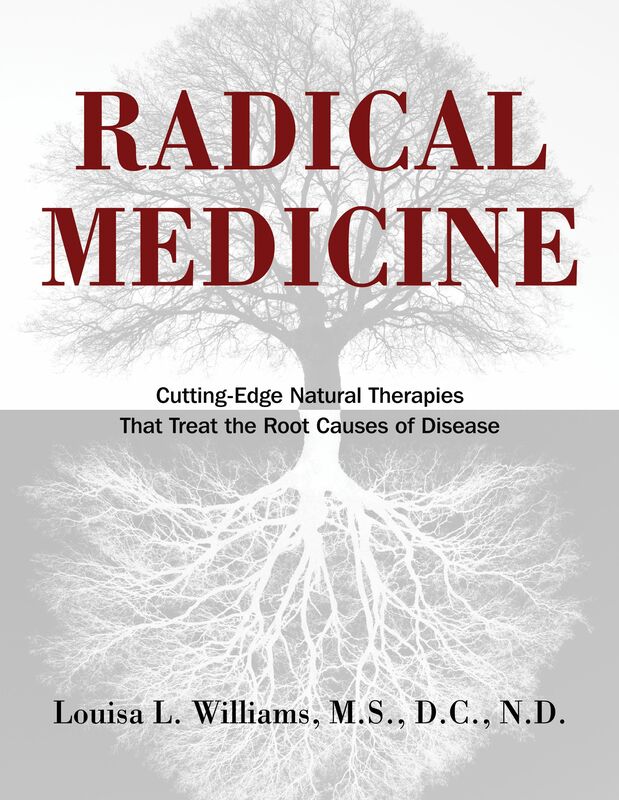 A practical guide for practitioners and patients alike, Radical Medicine offers a wealth of holistic, natural therapies for overcoming what is poisoning us and our world so we can achieve optimal health and well-being. There is no longer any question that toxic metals in our air, water, soil, and food supply have a clear and deleterious effect on our health. In fact, when the words ecology and environment first began to become part of our everyday speech in the late 1960s and early 1970s, the U.S. government responded with numerous antipollution controls. Although environmental groups would argue that many of these regulations and programs have been inadequate and implemented only after intense lobbying and political pressure, the government’s vast response to environmental pollution measured in sheer numbers--agencies, employees, and funding--cannot be denied. In dramatic contrast to the government’s response to environmental pollution, however, is its extraordinary lack of response in regard to an even more insidious and quite personal toxic insult: the placement of mercury amalgam fillings directly in our mouths. These dental fillings are significantly more damaging than toxic mercury emissions in the environment. In fact, studies have found that even when the environment is heavily polluted, the most significant factor that affects the levels of mercury stored in the body is the amount of mercury amalgam fillings in one’s mouth--not the polluted food, air, or water. Approximately 85 percent of the U.S. population has received one or more of these mercury amalgam fillings. In total, an estimated 144 million adult U.S. citizens, and 2 billion people worldwide, have mercury amalgam fillings. Yet the government’s silence on this subject--probably the greatest health controversy since Thalidomide and DES*--continues to be deafening. Despite the glaring scientific evidence that has mounted over the past few decades as to the clearly poisonous nature of this toxic metal, the U.S. Food and Drug Administration (FDA) did not classify dental mercury in any category; that is, as a class II device (requiring no proof of safety but subject to certain controls) or a class III device (requiring proof of safety) until July 2009 when, after a ten-year legal battle, they finally agreed to classify it as a class II device. Although even this was indeed a victory, consumer activists and holistic dentists and physicians contend that mercury amalgam should be classified as a class III device--that is, a potentially dangerous device that would need to be proved safe to be sold and used in dentistry. Since scientific research has incontrovertibly proved that mercury amalgam fillings are not safe, this would lead to these toxic fillings being banned. *Thalidomide, a prescription drug commonly used in England and Germany in the 1950s and 1960s, was pulled off the market in 1962 due to the horrible birth defects it caused in infants. DES, a synthetic estrogen formerly prescribed to prevent miscarriage and premature labor, was banned in the U.S. in 1971 after many daughters of women who had taken it later developed vaginal cancer. The occurrence of heart disease did not become statistically significant until the the 1920s. Over the next forty years, the incidence of coronary heart disease rose dramatically and became the leading cause of death in the United States. During this period not only did the use of margarine and refined oils increase approximately 400 percent but also the implantation of mercury amalgam fillings. Although many are aware of the dietary connection, few know about the correlation between mercury amalgam fillings and heart disease. One study published in 1990 found that individuals with amalgam fillings had significantly higher blood pressure and a greater incidence of chest pains (angina), rapid heartbeat (tachycardia), and anemia than those who were dentally mercury-free. As noted by the Ziff brothers, two esteemed dental researchers, the existing scientific evidence firmly establishes that exposure to mercury amalgam damages the tissues of the cardiovascular system and could be the “missing link” in the etiology of the prevalence of heart disease. When interviewing a potential dentist, one should always ask first about the mercury amalgam issue and reject any dentist who is still using this toxic material. Even if the dentist offers to use alternative materials, it’s difficult to trust a dentist to completely and thoroughly drill out all the amalgam material when he is still placing it into some patients’ mouths. Furthermore, it’s more likely that this dentist has not had all the education necessary to learn how to remove mercury safely. Removing toxic metals from the body is an essential step in the detoxification protocol of every holistically oriented individual. However, this removal must be done at the appropriate time, when the patient is strong enough to detoxify these heavy metals from his or her body with the help of appropriate nutritional supplements and remedies. Louisa L. Williams, M.S., D.C., N.D., received her doctoral training in naturo-pathic medicine from Bastyr University. She also holds a master’s degree in psychology and a degree in chiropractic. In 1984 she founded the Seattle Health Clinic, which specializes in environmental medicine and detoxification. She now lives and practices naturopathic medicine in Marin County, California.